..as I assumed we would. Thru Mother's Day, I mean. The day started of rather gloomy for both Paul and I. By "gloomy" I mean our moods. We were neither one sure of just what to do. We headed outside, planted a tree, worked in my weed garden...er, I mean, flower garden. Poor garden, had no care or readiness to prepare for fall, due to the fire an all that went on. It was a mess. Still is. I'll get it done. Maybe. As we were out working in the yard, the garage door (which was up/open) suddenly closed! Then, opened and closed again. And finally, opened and remained open. Paul asked me, "did you do that?" I had to remind him that I was in the yard with him and we watched together. It kind of freaked us both out. And we wondered, maybe, could it be our kids letting us know they were near on that day? No idea. But, Paul and I both know it happened. We saw it with our own eyes. We stood watching, in disbelief, really. I've never been sure about receiving "signs" from loved ones who have passed. I guess I never really had an opinion, one way or the other. But more and more things keep happening around this house. One day, I'll share with you, the sign I had one morning while home alone. This sign was so clear, it made my knees weak. Weak to the point I had to sit down. It was a sign from Brad. At any rate, I was pretty happy to let myself believe that the garage door going up and down on its own, was my two Angels, letting me know they hadn't forgotten me on Mother's Day. The day continued and surprisingly, Paul and I were pretty at peace after the above incident. We got cleaned up and went out to an early dinner at Smokey Bone's. We ate ribs--even I did. I splurged, but still accounted for all the food I ate (I do Weight Watchers). I talked to Ashleigh for a while. And received a really sweet card from her. It made me get all teary eyed. She also gave me an hour gift certificate for a massage. She knows her mom pretty darn good, cuz I realllllllyyyyyyy need a massage right about now. After we went to dinner, we headed to the cemetery, where I placed a hanging planter. I'm pretty sure that moms are suppose to receive on Mother's Day, but on this day, I give. I give to my two kids who were plucked out of my life so suddenly and so unexpectedly. That's just wrong. WRONG! We ended our day by visiting my parents. I gave my mom a planter, but forgot the card! Of all days to forget a card...I pick Mother's Day. Even though I dreaded this Mother's Day, it wasn't all that bad. I honestly do believe, that the anticipation that leads up to "special days" (holidays, and so on) is by far, much worse than the actual day itself. The dread is almost a fear that sets in. No matter how hard you try to fight it...it's there. And will be here, forever. On a side note. I'd appreciate some really good, positive vibes this week. I have a couple of doctor appointments. One tomorrow, the 15th and one on the 17th. The 17th is actually a procedure, it's at 11am and it has my nerves rattled, to say the least. So, if you have it in your heart, I could sure use some good vibes. This Mother's Day, I have a whole different take on the meaning. Honestly, I dread the day. Likely, no more than I dread every day. The day when mother's are happily enjoying their day and their children. Missing ALL, of my kids. And wish nothing more than to have all 3 of them here, with me, on this day. Instead, I will visit 2 of them at the cemetery. But, I will be thankful to be able to talk to Ashleigh on the phone. So happy that she's just a phone call away. just a little tighter today. One never knows what tomorrow may bring. 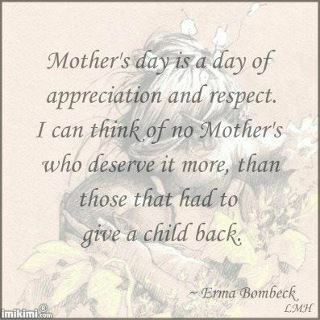 Happy Mother's Day to all those who grieve the loss of their children. May we all find some sort of comfort on this day. As I blogged about the other day, May 8th was 7 months since our fire. 7 months since we last saw our son. It was a hard day. Harder than I thought it would have been. I talked with Ashleigh on the 8th. She told me about, The Dream she had in the early morning hours of May 8th. Brad was in it. Actually, he appeared in her dream. She told me that he walked up to her, she turned to look at him, asking him, "What are you doing here?" He was all smiles. Very happy. His response, "I'm okay, Ash." (he has called Ashleigh, Ash, since he started talking. I don't think he ever called her Ashleigh!) He went on to say, "Tell mom and dad." How about that?? It made tears run down my face. I think he actually came to her that night. I've yet to be able to dream about Brad. I've had many dreams about Carly. They've been awful. Very disturbing. But, I've had no dreams about Brad. It makes me sad, really. However, I'm so happy that he appeared in Ashleigh's dream and that he was happy. Like Ashleigh said, "I guess there's some comfort in that." Paul had such a hard time hearing about that dream. He cried and cried and cried, as we stood at the graves of our children. We both decided that it had to be a sign. That he must of came to Ashleigh during the night. I've never really believed in that kind of stuff before, but this is makes me rethink many things. Sure, we've been having some pretty strong signs of Brad's presence around here. Carly's too, for that matter. But nothing like, The Dream that Ashleigh had the other night. I'm trying to do a blog makeover. Please pay no attention to the jumbled, under construction look! but instead learn to live with it, just one day at a time. who didn’t help or comfort me the way I needed them to. They truly did not know how. for maybe if I smile a little, my heart will soften and I will begin to heal. for they are hurting too, and perhaps we can help each other. I could of done to save my child(ren) from death, I would of done it. because I know that would make my own child proud. 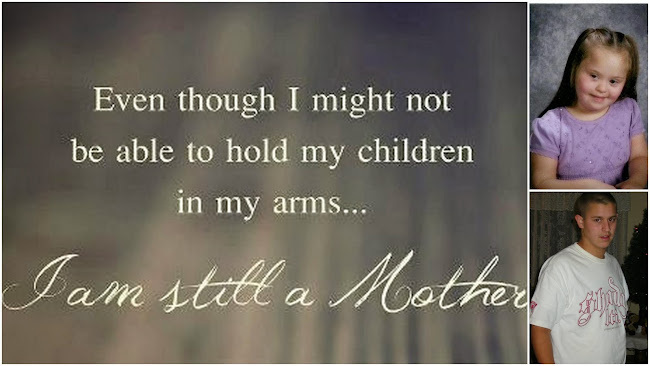 to another bereaved parent for I do know how they feel. and the only reason I hurt is because I had the privilege of loving so much. Just for today I will not compare myself with others. I am fortunate to be who I am and have had my child for as long as I did. my life did go on, and I am the only one who can make that life worthwhile once more. Today is 7 months ago since we've seen Brad. I'm still having such a hard time wrapping my brain around this cold, hard, fact. When Paul and I left our home that night, at 5:15pm, back in October, we NEVER dreamed that we would never see our son again. At 6:05pm, I called and talked to Brad- he told me what he wanted me to bring him home from the restaurant. He ordered a steak, baked potato and fries. I asked him how his steak should be cooked. I thought rare, he corrected me with, "medium well." By 6:50pm, Brad was gone. Fire engulfed his room. Smoke filled our home. Our son, was gone. We never got to say goodbye to him. We never again laid eyes on his face. He was gone. It's hard to say goodbye to someone that you can not actually see. It's hard to say goodbye to your child whether or not you can actually "see" them. But for us, it was especially difficult because Brad's funeral was a closed casket. It's so hard to try and make sense of all that has gone on in our lives over the past 25 months. Sometimes, I think that maybe it was me who died. Maybe I'm looking down over my family. Or, maybe I've been in a coma for the past 25 months. I mean, seriously, how can this be happening? Not once, but twice. So, Just For Today, I will try extra hard...but I can't make any promises for the days, months, years to come. I miss my son. I miss my daughter. I miss the way my life used to be. 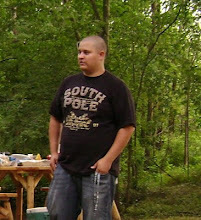 I miss the 'old' me. I just can't get to know this 'new' me. And sadly, dammit, there is not one single thing I can do to change any of this.